Water buffalos coin the Southeast Asian landscapes. At the moment one leaves a city or town, they adorn the countryside. Water buffalos are very lovely and sweet animals and, despite of their size, mostly harmless. Even kids shepherd them. It's just if one comes very close to a water buffalo and the big animal makes an unexpected, abrupt move it, without intention, could harm a human. Their huge horns are pretty impressing, though, and if a stranger comes close, they take in a position of defense. A domestic water buffalo gains a weight of up to 500kg and a lenght of two meters at a height of 150cm to 160cm. The wild ones grow much larger, can gain a thousand kilogramms and a length of 3m at a tallness of 180cm. Exceptionally a wild bull could attack a human or even an elephant, in case he feels threatened himself or defends his fellow animals. Also injured bulls, particularly wild ones but also domestic, can be aggressive and attack a human. Nowadays there are 74 different kinds of water buffalos known worldwide. Almost all of them are domestic animals. The origins of domestication is not fully clear; it first happened either in China or India and dates back at least 4,000 years. 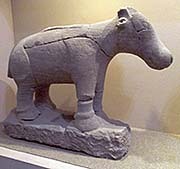 To Southeast Asia the domesticated water buffalos came particularly from India, but also from China. 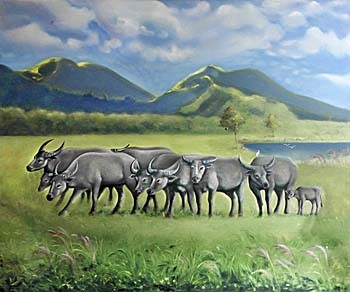 The Malay water buffalo is the most common one in Indochina and Indonesia, while the Carabao water buffalo is endemic in parts of the Philippines and Guam (exterritorial USA). 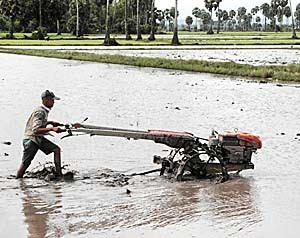 Water buffaloes are deployed in field work for ploughing the rice paddies, pulling carts, and sometimes they end up in the diet, particularly when they got too old to work anymore. By the way, they can't get the horrible BSE disease under which cows in the west suffer sometimes. The buffalo's leather can be used and the cows can give nutricious milk. Milk plays no prominent role in Southeast Asia, though. 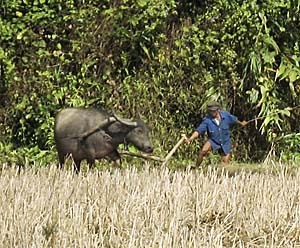 In terms of microeconomics, water buffalos are often the most valuable possession of Southeast Asian peasants. The loss of a water buffalo can mean a big desaster for a rural family. 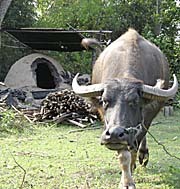 Dowries for example are traditionally payed in buffalos instead of money in many Southeast Asian societies. Remarkable is the decline of the water buffalo population in Thailand. After the official statistics the 2009 population was above 1.3 million, while it declined to below a million in 2012. It's not only because the water buffalos face 'unemployment' by being replaced by tractors, but they bring a higher selling price outside of Thailand, which led to a mass deportation in the last years. In some areas are buffalo fights part of the local folklore. I have seen such a disgusting event once around Bukittingi. The whole infamous thing is of course again about betting money. It's one of the notorious variations of gambling. In other regions annual buffalo races take place. It's of course also about money and gambling. The differences between the common domestic water buffalo (Bubalus bubalis) and the wild species (Bubalus arnee) are slight. The wild one is clearly the ancestor of the domestic one, but it's widely disappeared as such. In fact it's classified as a 'critically endangered' species. Since the difference is so small, it's difficult to distinguish wild water buffalos from escaped domestic ones. An escaped domestic one would, if finding a herd of wild buffalos, join them and interbreed with them. In Cambodias eastern province Mondulkiri might be some wild ones left, in Thailand are an estimated 50 individuals left in Huai Kha Kaeng reservat, what covers parts of Kanchanabury province and the region north of it, at the border to Burma / Myanmar. For Burma there are no numbers known. 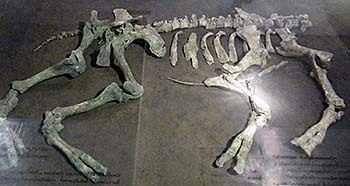 In Laos and Vietnam they are extinct. 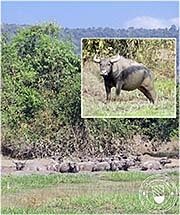 Nevertheless, the wild water buffalos 'Bubalus arnee' are native in Southeast Asia. The water buffalos natural habitat is open marshlands, swamps, swampy forests and densly grown river valleys. The big animals have the habit to dig into deep mud or stay in the water, holding their faces only above the water line. There they find protection against particularly mosquitoes and other bloodsucking insects. 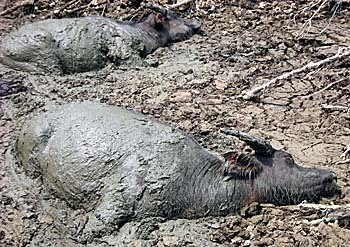 The rest in the mud also cools the archaic looking animals, and after leaving the mudhole, the buffalo is covered with a mud layer which gives him further skin protection. 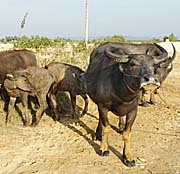 The original live of the water buffalos is coined by wandering through the landscapes, particularly wetlands, in herds of around 30 animals, led by an old, experienced cow. This herds consisted of femal animals and their kids. Bulls are chased out of the herd and gather themselves in smaller bachelor herds of around ten individuals. The bulls become solitairs when growing older, exept from their seasonal joining a herd with females. After a time of mating they are again chased away by the leading cow. A cow can get a calf once in two years. The duration of a pregnancy is eleven months, nursing time is around six months, sexual maturity comes in the age of three years. In the time while nursing a buffalo cow can be aggressive. A wild water buffalo has a life expectancy of 25 years, domestic ones live a few years longer. The water buffalos feed mostly from grass and some kinds of other vegetation. They can become a crop pest when they invade gardens and plantation who are not protected with a fence. I could observe this problem on Samosir Island, Lake Toba. The only natural enemies for them are, besides humans, tigers and crocodiles. An attacking tiger can be defeated by a coordinated defence of some adult buffalos. There are cases reported that they killed a tiger with their horns. That's why tigers try to prey on calfs who walk a bit too far from the herd. Between the domestic water buffalos are two distinguished kinds. 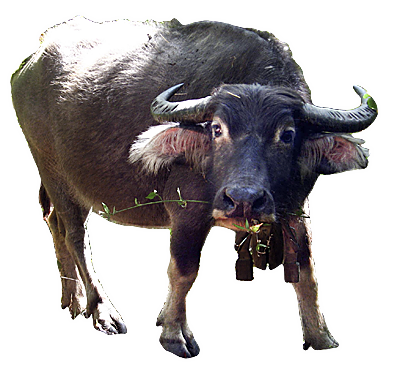 In Southeast Asia the swamp buffalo is endemic. In India and west of it there are mostly river buffalos living. Cries of birds and animals weave a tissue of sound. Half-way on one's journey the country opens up suddenly, without a sign of trees. As far as the eye can see there is nothing but an abundance of wild millet. Wild buffaloes, by hundreds and by thousands, gaze in groups in this region. By the way: In Thailand water buffalo ('kwai') is a bad word. Calling someone 'kwai' means insulting him (or her) in a comparable way as calling someone a 'pig' in the west. I want to add here that this is pretty unfair against the lovely, sensitive and intelligent animals.